Allyson M. Manumaleuna comes from a football family. She is the sister of Brandon Manumaleuna, who played 10 years in the NFL as a tight end with the St. Louis Rams, San Diego Chargers, and Chicago Bears. Her father, Frank Manumaleuna, was an NFL linebacker for three years with the Kansas City Chiefs, and played one season with both the United States Football League (USFL) Oakland Invaders and Portland Breakers. Manumaleuna serves as president and executive director of Outside the Game, a nonprofit organization that offers educational and life skills workshops to student athletes, helping them to achieve success in all areas of their lives. 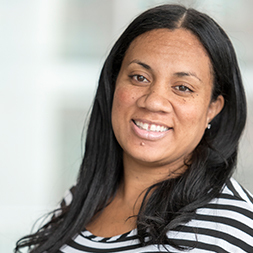 She is also an active board member of the Big Jon Manumaleuna Foundation, which focuses on supporting Polynesian and minority athletes as well as their families, with an emphasis on culture, education, and making positive life choices. As social worker and advocate, she continues to support athletes of all levels in leading meaningful lives and attaining successful careers. She is committed to making a difference in the development of athletes on and off the field, and continues to create programs to help players reach their highest potential outside the game they love.